Georgia Tech became the 3rd campus in the state to voluntarily install safety rails on all elevated beds. After purchasing over 8,000 safety rails, GT begins the arduous task of installing safety rails on any bed over 30″ off the ground per CPSC (Consumer Product Safety Commission) standards. Upon checking into their rooms, students in residence halls will find the rail in place to prevent injury from rolling out of the bed. Language in the Housing contract states the reason for the rail and explains the liability the student assumes should the rail be removed. 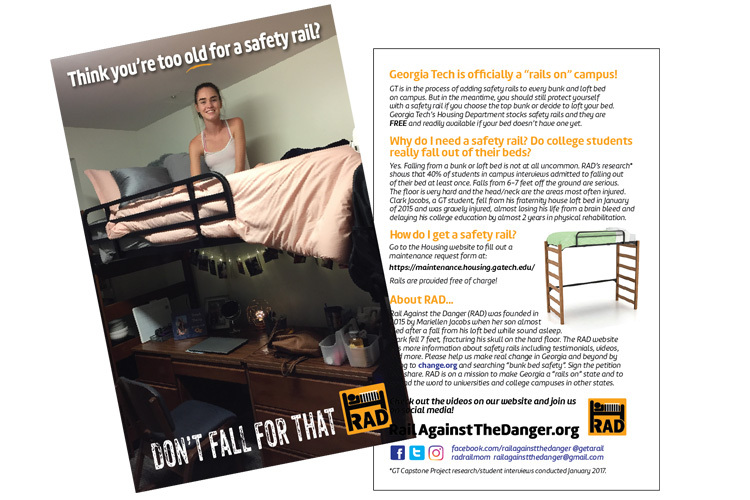 RAD is still working toward every public campus in the state of Georgia installing safety rails on bunk and loft beds by Fall 2019. So glad to see that Georgia will be a rails on state soon! You are a rock star Mom taking your experience out to all families and professionals. All elevated sleeping environments should include this basic safety feature.